Wanted to share this image of a hand hooked rug that my long time friend –since kindergarten – Nancy Hall made. (newmorningfarm.ca) The story behind “Hey, it worked for Yoko Ono” is one of my favorites. Apparently John Lennon wandered into a gallery in New York, and climbed a ladder that was part of the art installation, only to find the word “yes” written on the ceiling. He HAD to meet the artist and the rest is history as they say. 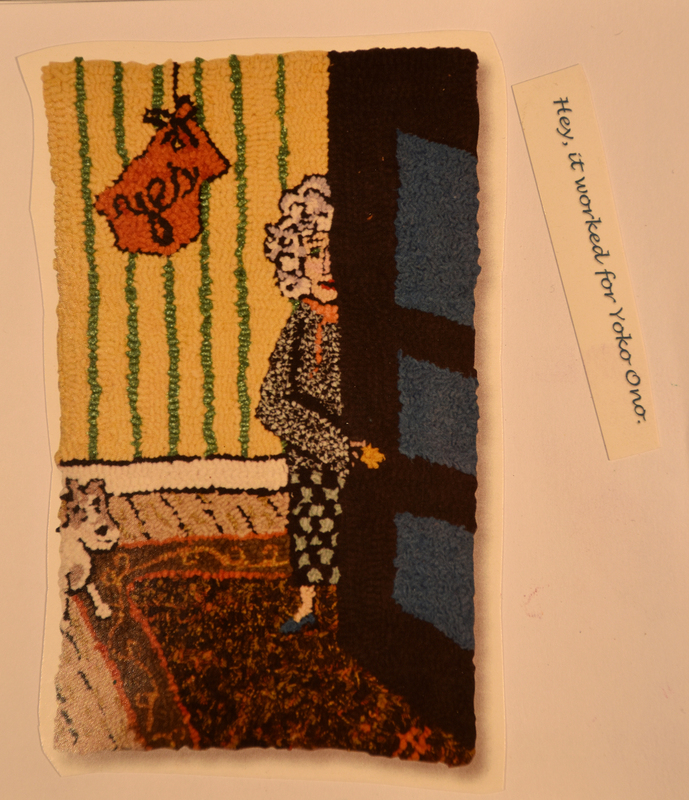 Her rug shows a woman opening a door, inviting someone/something in. Saying “yes” and inviting in, is the first and most important aspect of the creative process. Perhaps even in life. For negativity and shutting out or down is soul destroying. Playtime: What do you want to invite into your life? What have you been denying yourself? Perhaps time to just be with yourself. I remember after completing my Masters program deciding to say yes to everything, as I had had to say no for some time. Yes is an opening. Do some writing or art making about all this. Have fun! You always invite the best in everyone Joan. And, you are an amazing example of simply saying yes even in the midst of all the no’s, thereby forging a life that is, in and of itself, a work of great creativity and beauty. Thank you. Ditto to you! Thank you for your comments and for your example of living creatively! Your words are inspiring…and it is a reminder for us all. Saying YES!! gosh, how much we miss out on when we don’t jump into life and just live it! We must always remember to play! Thanks for being you. also..love the wonderful handmade rug…wow!